There is no doubt about the difference between European and American roulette. Today, however, we will focus on a special type of roulette that some of you may not even have heard. It is an online roulette with three wheels. As you can see in the picture, it is a classic European roulette, except that it contains two additional wheels. There is still only one slot in the middle to capture the ball. All 3 wheels are spinning independently of each other, so after the end of the game, the roulette generates 3 different results. One number can appear in the result twice or even three times. How Does 3 Wheel Roulette works? For example, if you bet € 5 on red, the bet is automatically raised to € 15. Note: You cannot bet on only one roulette wheel. All bets you make are automatically multiplied by three and applied to each of the wheels. Note: 2: Moreover, it is also not possible to bet on one of the wheels more than another. All bets are automatically the same high. Interestingly, the probability and house edge remain the same for the 3 Wheel Roulette. As mentioned earlier, it is the same as 3 individual spins. House edge stays at 2.70%, which is a very good news because new roulette variations usually have a higher casino advantage. 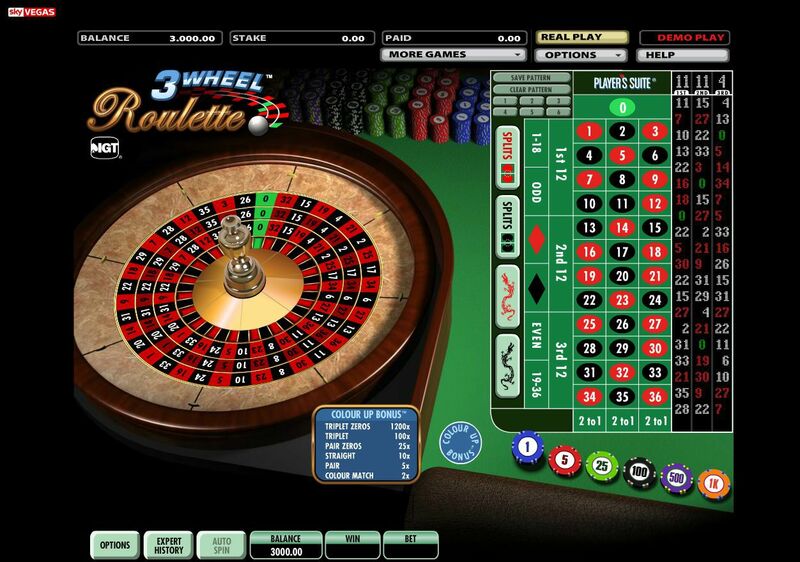 Just not to be a copy of the European roulette, special bets are added to the 3-reel roulette. You cannot bet on these bets individually, but instead, you just make a side-bet, which covers all above. Just remember, that before you start chasing amazing payouts, house edge for this side bet is significantly higher.